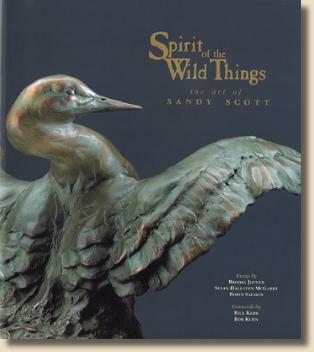 Sandy Scott is widely recognized as one of the country’s premier animal sculptors and printmakers. Interweaving, as Robin Salmon, curator of sculpture at Brookgreen Gardens writes, “the continuing thread of the animalier in American art.” In this lavishly illustrated treasury of sculptures and etchings, words and pictures intertwine to revel both the substance and the style of a sculptor who lives the life she depicts. Designed with highest possible standards, including a wealth of specially commissioned color plates and black-and-white photos, this book is meant to be savored and cherished. At its heart are Scott’s own thoughts and musings, compiled in her journals over the years. 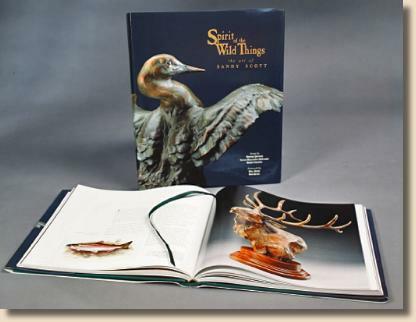 Organized into four chapters titled Seeing, Feeling, Understanding and Expressing, these tantalizing essays summarize Scott’s working methods, beginning with childhood years hunting and fishing, which established her lifelong profile as an avid outdoorswoman and lover of animals. The reader is enchanted by tales of the artist’s affection for wild places, whether in northern Colorado or surrounding her tiny cabin on an isolated island on Lake of the Woods in Canada or her headquarters on the banks of the Popo Agie River in Lander, Wyoming at the foot of the Wind River Range. 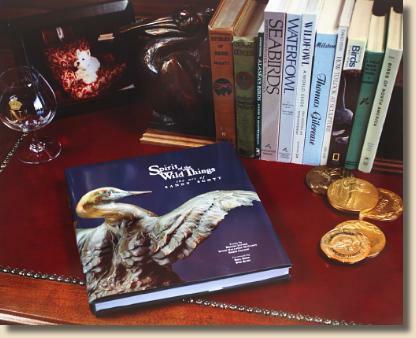 But this book is not just a compilation of memories; it is also a learning tool for anyone curious about the structure of birds and the miracle of flight. In the chapter Understanding, Scott takes you on an armchair journey inside the bodies and bones of birds. In layman’s language she explains the evolution of birds from their prehistoric ancestors and illustrates the elements of aerodynamics that propel a mallard off the choppy surface of a lake or stall an eagle as it skims the water to grasp a fish in its talons. Blending science with beauty, Scott reveals insights she has garnered from years of teaching others the mechanics of sculpting birds. In Expressing she explores how her own style moves from loose to precise depending upon the subject before her. Drawing firsthand experience as well as art history, she emphasizes the importance of design and composition and helps art collectors learn how to view a sculpture in order to appreciate both its detail and its larger shapes. Spirit of the Wild Things also includes examples of Scott’s popular etchings. Concise, colorful captions express her immediate thoughts about the creatures to which she gives form. A detailed Chronology identifies the major events that have impacted the life and art of this 20th century animalier whose bronzes cry out to be loved, admired and respected – to be touched with the hand and the eye, with the mind and the heart. Through words and pictures, the reader connects to the primal spirit of animals and senses the exhilaration of lifting into the air with geese, running at breakneck speed with horses, luxuriating in a warm sun spot with a preening cat or reveling in the loon’s oneness with nature’s eternal rituals. Through Sandy Scott’s art, you learn that once you open your mind, eyes and heart, you will find places where wilderness and civilization meet… and joyfully coexist. Would die of great loneliness of the spirit.